This spring (I know, that seems so long ago!!) we took infant swim lessons though our local Recreation Center. I know sometimes swim lessons for infants can be controversial-- I'm not going to join this debate. If you have any doubts, wait until you child is over one year old to start swim lessons and proceed only with activities with which you are comfortable. 3. Heck, it sounded like fun, and I'm always looking for fun activities to do together! First and foremost, Ethan really enjoyed the classes, and I was able to see growth and development in the pool, even over the course of only six weeks. Possibly my favorite activity we learned is to toss a floating object out for baby to reach for (we use his small rubber duckie) and encourage them to reach for the object. You hold them "floating" on their bellies and help propel them towards the object, teaching them to reach and stretch with their arms. It's incredible how this naturally progresses into the baby cuing you to move forward by leaning forward into a "swimming" position, and adding the kicking of the legs. The best result however, was a confidence for both of us in the water, making our summer pool trips significantly safer. I mean, let's face it...It's scary to hold your squirming infant in 4 feet of water (and they're scared too!) But now I know things like how to get into the pool safely and we are both more comfortable in the pool together. Unfortunately for us, our local public lessons are not held year round, however, I am certain that we will be taking lessons again the next time they are available! 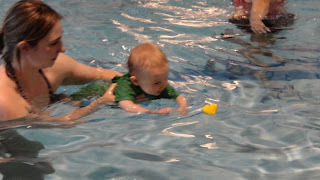 Have you ever had success with baby swim lessons? What water games do you play with your baby or toddler in the pool? ...because they may just surprise you! #16 on my Summer "Quality Time" Top 25 Bucket List was to go to an art gallery or art walk. This weekend I amended that bucket list line item (it's my list...I can do with it as I please!) to "Go to an art exhibit." My reasoning is simple. We were at the State Museum in Harrisburg, PA to visit Curiosity Connection, and they just happened to have a special art exhibit on display. Perfect!! So we went to the exhibit. We walked around and I talked to Ethan (for reference- he's 11 months old now) about what he was seeing. "Look at all the paintings. You make paintings, right? Look, that one is of a cat!" Ethan has his "THAT" finger out and ready! He was totally interested in what he was seeing! More so than I would have ever imagined. He was constantly exclaiming "THAT!" and pointing at things that he liked. 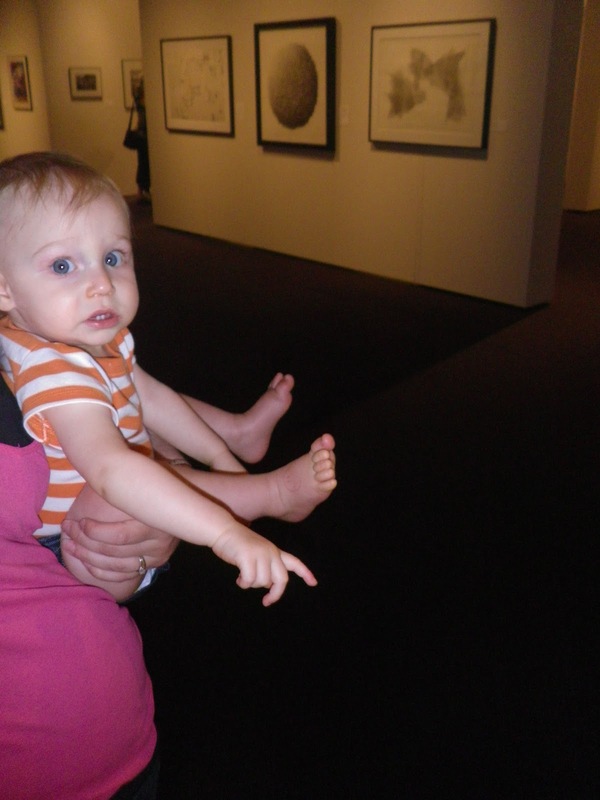 This isn't Ethan's first trip to an art exhibit. 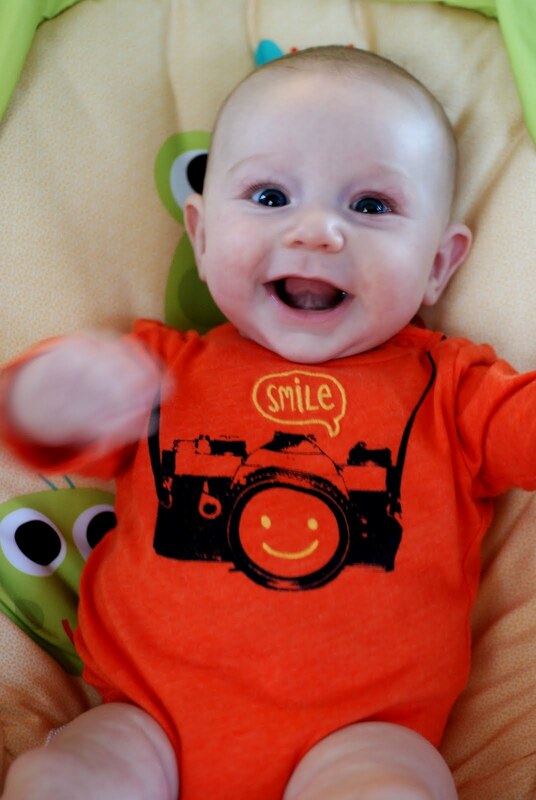 In fact, his grandpa and I took him to an Ansel Adams exhibit when he was barely over two months old. Can't start too young! Ethan before his first art exhibit trip! So I ask again..why take a baby to an art exhibit? Because they may just enjoy it more than you would think--and a little culture and excitement is never a bad thing! I saved this science and exploration activity for one of those nights when the little guy decided that he just wasn't going to go to bed on time. Looking at fireflies in a jar was #21 on my Summer Top 25 Bucket List! As the sun was setting and the fireflies (or lightening bugs) were just starting to come out for the night, we got out a jar and caught ourselves some bugs! I caught maybe 5 or 6 bugs in the jar before we sat down and really took a closer look. The fireflies were stubborn and didn't want to light up at first, but it didn't matter-- Ethan's 11 month old curiosity was fixated on them running around the jar anyway! We talked about the bugs and how they lit up so brightly. I held one gently between my fingers so he could take a closer look, and even let him try his hand at holding one. When we were done, we opened the lid of the jar and one by one watched them fly away. Want to further enhance the firefly activity?? Find and read a copy of The Very Lonely Firefly by Eric Carle (I think it may be out of print, but it's still available!) I would have never known about it had Ethan not fixated on a copy at Curiosity Connection in Harrisburg! Learn and practice the ASL sign for "bug"
It's no secret that I am forever searching for appropriate day trip adventures for children 0-3 years old. Visiting a new museum with an exhibit for babies/infants/toddlers was #1 on my Summer "Quality Time" Top 25 Bucket List. Play and exploration yield so many great benefits! Play boosts creativity and imagination, increases self-confidence, problem solving skills, and the ability to self-regulate. You can easily amplify those benefits by playing together as a family. We recently took a family trip to the State Museum in Harrisburg to visit the Curiosity Connection exhibit. Curiosity Connection is suggested for children 1-5 years old. Their suggested ages are pretty accurate, although it would be appropriate for a younger child who is mobile and likes to explore (maybe starting around 9-10 months old). We definitely enjoyed Curiosity Connection! As always, Ethan enjoyed playing with toys that weren't the "same old toys" he has at home. He especially liked the animated owl in a tree, fishing with magnetic fishing rods for realistic looking fish, and driving the farm truck! The kids playing in the farming area looked like they were having a great time too! It was easy to see from the exhibit that it was designed with the intention to utilize play as a method of learning. The admission was inexpensive and the exhibit offered an excellent opportunity for imaginative play. In addition, I always love a good indoor play area with year round climate control! You can also visit the rest of the State Museum while you're there. Like most museums of it's time, it's a bit dated, although the scientific information is still relevant and interesting. We will definitely be returning!! We recently took a return trip to Port Discovery in Baltimore's Inner Harbor. We specifically went to visit "Tot Trails," the exhibit for children 0-3 years old. The first time we visited, Ethan was 6 or 7 months old. Now, at 10 months, he was able to enjoy even more of the exhibit. So what were the highlights this time? The big sand box area. Port Discovery once again proved to be a great place to visit. At this point, Port Discovery is possibly the best play area we've visited that's inclusive of the whole 0-3 crowd. The Maryland Science Center, also in Inner Harbor, is a close second. Check my first post to see more about our first experience at Port Discovery!! For an infant or young toddler who loves the water, an inflatable pool for the backyard makes for a great afternoon. A bit by accident (drying the pool indoors due to a rainstorm) we also found that the infant pool is just as much fun indoors without water as it is outside with water! Ok, maybe not JUST as much fun, but really darn close! We purchased an infant sized inflatable pool due to help make our lives easier and fit better in our outdoor space. Hint: The infant pool is also great because it only takes approximately 3 gallons of water to "fill," making it much easier to fill the pool with warm water from the tap. Since the pool is played on so frequently (climbing and flopping in and out), we actually bought a second pool to save in the closet "just in case." Any other creative uses for a baby pool? What are your favorite pool toys?? 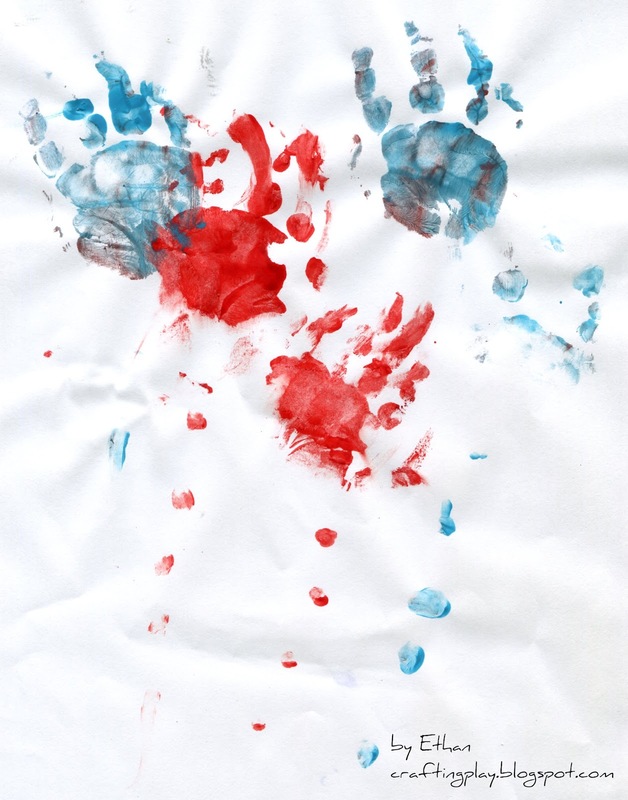 This morning we made fireworks with Ethan's handprints for 4th of July. We used red and blue paint for a "festive" touch. The fireworks were done with handprints, then we used fingerprints to create the fireworks trail. Of course, this project is a bit guided, so as always, I let him go to town on his own fingerpainting afterwards! Enjoy, and have a happy and safe July 4th holiday!!! More instruction on how to fingerprint with a baby. The 4th of July always reminds me that summer is indeed in full swing, and lights a fire in me to get my summer rolling! This week I read about a recent survey of over 1,000 mothers and babies conducted by the National Institute of Child Heath and Human Development confirmed that it isn't the amount of time mothers and babies spend together, but the quality of time. In fact, they found profound benefits to children who spend time in high-quality child care including aiding in thinking, language, and learning skills. These children were also found to have an improved transition and performance in first grade. The same can be accomplished by attentive stay-at-home parents who encourage socialization in their children (via regular playgroups, etc). Most importantly: No matter what your situation, Quality time is key! That brings me to my Summer Top 25 Bucket List. A list of quality "crafting fun" activities specifically suited for an infant/toddler! Look to see specific posts on some of these items as we enjoy our summer!! What's on your summer bucket list?? Together we can make this a summer to remember!